Join the discussion on our forums! 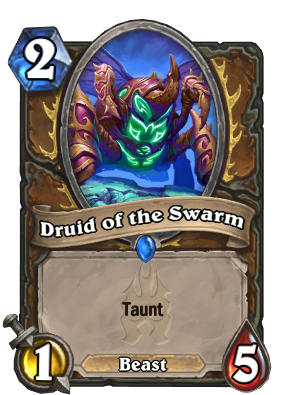 Come discuss Druid of the Swarm over in our dedicated Druid of the Swarm discussion topic. Choose One - Transform into a 1/2 with Poisonous; or a 1/5 with Taunt. The Druid awoke from troubling dreams to find herself transformed into a giant spider. I hate this card so much. Very solid card when played on curve. Druid of the Swarm with Fandral is filth. It's a giant Stubborn Gastropod. A 1/5 with taunt on turn 2 is pretty repugnant if you ask me. What does this do with Fandral Staghelm? Is that flavor text a Kafka reference? This card easily wins my award for best looking card, and yeah, the play off the details in the card are perfect. Her pose, the position of the feathers, the shades of green violet and purple, which are very zerg orientated are perfect And don't forget the name of the card! 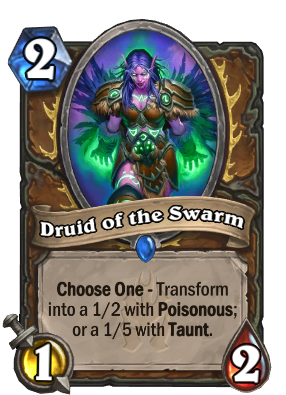 simple it should be "transform to gain poisonous or +3 health and taunt"
Urg this is just going to be in token druid isn't it? aren't they bolding poisonous ? 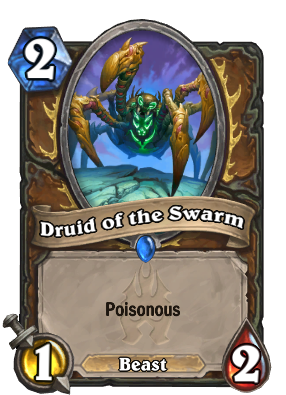 2 mana 1/5 taunt is meh 2 mana 1/2 poisonous is awful stuborn gastropod is just so much better. 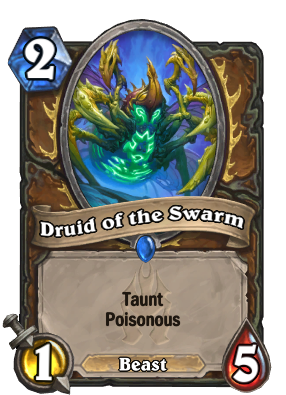 also If this card were slightly better lets say 1/6 taunt or 1/3 poisonous I'm not sure what archetype it'll fit for druid. But see, it's whatever works best at the time; as I said in a previous comment, when you've got the initiative you can play this down and force the opponent to play something to trade into it. If you need to regain the initiative, it's got enough power to kill 90% of the one drops being played and enough toughness to take two or three of them out with it.